The Parables of Care project has been present at ‘Performing and Picturing Patienthood: Exploring Graphic Illness Narratives‘, a symposium convened by Dr John Miers (Kingston Schoool of Art) to mark the end of his Researcher in the Archives residency in University of the Arts London’s Archives and Special Collections Centre at London College of Communication. Last night (Thursday 4 April 2019), as Parables of Care PI, I attended the opening session, handing out physical copies of the comic and live-tweeting using the event’s #pppatienthood hashtag. Today (Friday 5 April 2019), Parables of Care artist Dr Simon Grennan (University of Chester) will participate in the closing session scheduled at 5.15 pm and titled “Performing on the Page”, in which John Miers will be in conversation with Simon. “How does producing graphic autobiography help artists to express and process experiences of illness? How is the tension between fictionalisation and disclosure navigated in this process? To what extent do such narratives reinforce stereotypical models of living with, or treating, illness? Marie-Pier Caron and Ruhina Rana of the Bachelor of Science, Nursing program, Douglas College, and their poster at the West North-Western Region Canadian Association of Schools of Nursing conference, Edmonton Alberta, February 20-22, 2019. Marie-Pier Caron and Ruhina Rana of the Bachelor of Science, Nursing program at Douglas College, Vancouver, did a poster presentation on I Know How This Ends (a companion comic to City/Chester/Douglas’s Parables of Care) at the West North-Western Region Canadian Association of Schools of Nursing conference in Edmonton Alberta on February 20-22, 2019. The theme of the conference was Rejuvenating Nursing Education through Relational Practice. 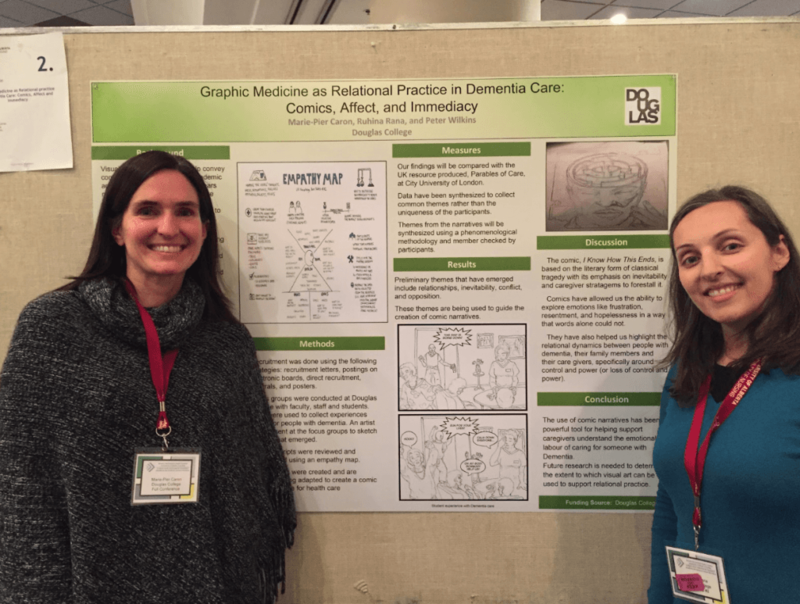 The topic of the poster was Graphic Medicine as a Relational Practice in Dementia Care: Comics, Affect, and Immediacy. It was one of three posters relating the arts to nursing care. The others were on music therapy and dementia care and arts-based instructional strategies in mobile learning. The poster featured artwork by Melissa Martins from the formational stage of I Know How This Ends and attracted a lot of attention. Copies of Parables of Care were also on hand. Visitors to the poster were impressed with the possibilities of using comics as an icebreaker for discussing dementia in a classroom setting because of the visceral power of the medium. Most suggested that they would not have thought of using comics as an educational tool. Marie and Ruhina were surprised to discover some pushback from nurses on the term “Graphic Medicine.” Apparently, nurses in Canada have spent a lot of time establishing nursing as its own discipline and associate “medicine” specifically with doctors. This distinction might be useful to explore in future discussions of the sub-discipline. Perhaps “graphic healthcare” might be a more amenable term. Marie and Ruhina wished they had a QR code to connect their audience with further information about the Parables of Care/ I Know How This Ends project. That is another thing to consider for the future. Poster presentations are not always easy in big, crowded conferences as they are often squeezed into breaks between sessions and have to vie for attendees’ attention with coffee and snacks. Nevertheless, Marie and Ruhina were thrilled with the attention the poster received. It inspired them to continue with the project and develop it further. Last year, Dr Peter Wilkins and Marie-Pier Caron of Douglas College did a presentation on the Parables of Care project at the Western Canada Health Science Educators conference in Parksville, British Columbia, May 17-18 2018. 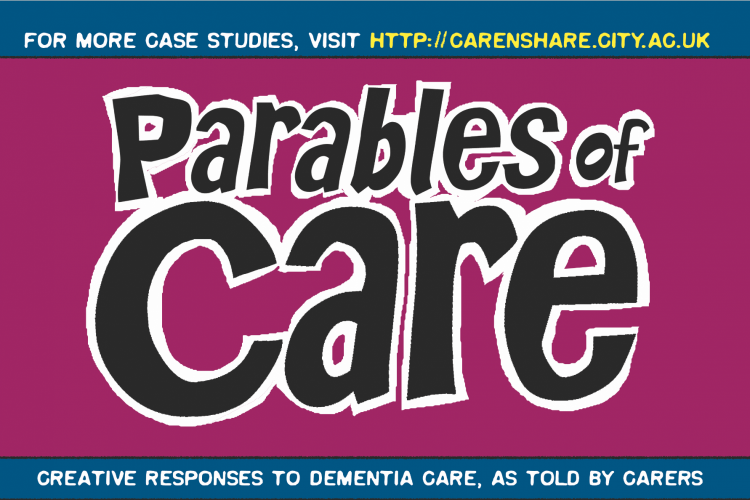 For more information about the Canadian part of the Parables of Care project and I Know How This Ends, please contact Dr Peter Wilkins, wilkinsp at douglascollege.ca. Following our release of the German version of Parables of Care on 24 January 2019, The University of Chester Forum Magazine published a one-page piece about it, on page number 8, with the title “Creative responses to dementia care now available in German” [PDF]. A BOOK representing creative responsesto dementia care, through carers’ eyes and produced in a new visual format by a collaboration including an academic from the University of Chester, is now available in Germany. Parables of Care. Creative Responses to Dementia Care, As Told by Carers is a research-based comic book, originally published in English in October 2017. It has now been released in German, translated by Dr Andrea Hacker, from the Open Science Team at the University of Bern. 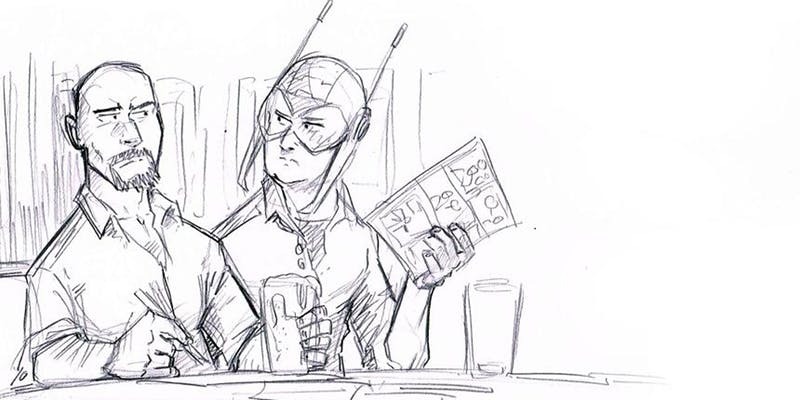 The short comic book was created by Dr Simon Grennan, from the Department of Art and Design, University of Chester; Dr Ernesto Priego, from the Centre for Human Computer Interaction Design, City, University of London and Dr Peter Wilkins from Douglas College, Vancouver, Canada. The small international team looked to expand the accessibility of this archive of carers’ stories and found that by creating short graphic art stories they could portray the emotion conveyed in these situations. Each story involves only four panels and is just one page long. Unlike clinical descriptions, this form enhances the affective aspects of each story, putting the reader at the centre of situations that are often on the verge of incomprehensibility, but which are all resolved. In this respect, each story is universalised and becomes a parable. The book is available open access to dementia carers and the general public as part of ongoing engagement, training and development programmes at City, University of London, the Tavistock and Portman NHS Foundation Trust and The Faculty of Health Sciences at Douglas College, Vancouver, Canada Vancouver. Parables of Care. 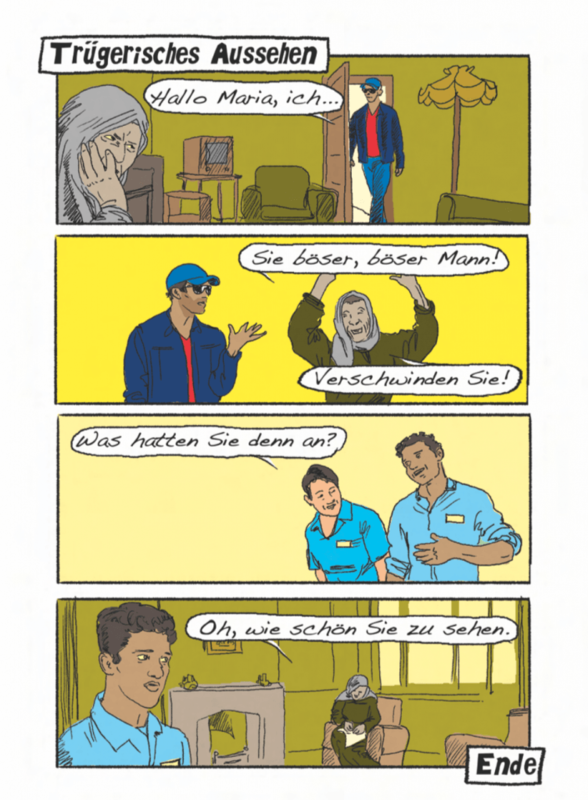 Creative Responses to Dementia Care, As Told by Carers ist ein auf Forschung basiertes Comicbuch das ursprünglich im Oktober 2017 auf Englisch veröffentlicht wurde. Parables of Care erschien nun auf Deutsch, übersetzt von Dr. Andrea Hacker (Universität Bern, Schweiz). 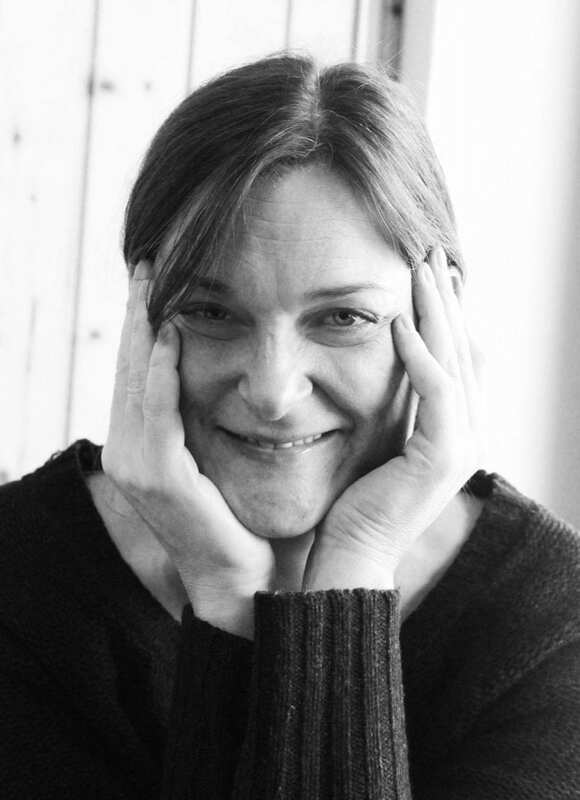 [Unser Interview mit Andrea finden Sie hier]. Das Comicbuch wurde von Dr. Simon Grennan vom Department of Art and Design, University of Chester, UK; Dr Ernesto Priego, vom Centre for Human Computer Interaction Design, City, University of London, UK und Dr Peter Wilkins vom Douglas College, Vancouver, Canada geschaffen. Das kleine internationale Team wollte den Zugang zu den gesammelten Erfahrungsberichten von Pflegenden erweitern und fand dass kurze, grafische Erzählungen die starke Emotionalität solcher Situationen ideal schildern können. Jede Geschichte besteht aus lediglich vier Panels und ist nur eine Seite lang. Im Unterschied zu klinischen Beschreibungen, unterstreicht diese Art der Darstellung die emotionalen Aspekte der jeweiligen Geschichte, was die LeserInnen in Situationen transportiert, die zwar oft an das Unverständliche grenzen, jedoch gelöst werden können. Auf diese Art wird jede Geschichte verallgemeinert und zur Parabel. Das Buch ist im Open Access zugänglich für Demenzpflegende und ein allgemeinenes Publikum. Dies ist Teil laufender Engagement-, Trainings- und Entwicklungsprogramme am City College der Universität London, am Tavistock and Portman NHS Foundation Trust und der Faculty of Health Sciences at Douglas College, Vancouver, Canada. Dr Andrea Hacker ist Lektorin, Übersetzerin und Open Access Spezialistin, die an der Universität Bern arbeitet. Nach Aufenthalten in den USA, Russland, Irland und Deutschland lebt sie heute in der Schweiz. Während ihres Studiums an der Universität Kalifornien Los Angeles wurde sie von Michael Henry Heim in literarischer Übersetzung betreut. Dr Andrea Hacker is an editor, translator and open science professional and lives in Switzerland where she works at the University of Bern. Andrea has previously lived and worked in the US, Russia, Ireland and Germany. She was mentored in literary translation during her graduate studies at UCLA by Michael Henry Heim. She translated Parables of Care into German. I asked Andrea some questions related to Parables of Care. How did you come across Parables of Care? I think on Twitter (by you, actually) after I tweeted about the heartbreak of watching a loved one succumb to the illness and my ineptness of dealing with it. What were your first impresisons of the comic? I loved it. It offers such kind and simple ways of defusing situations that can occur at any moment with a loved one suffering from this dreadful disease. The closer you are to a person, the more difficult it becomes to accept, understand and appropriately react to the change in behaviour and character that can occur. This little book showed me that there are gentle, simple ways of adjusting. It gave me hope. How did the idea of translating Parables of Care into German came about? Due to my family background, I live a bi-lingual life, German and English. We are grappling with dementia in our German-speaking branch of the family. When I read it, I wanted to share Parables of Care not only with them and the wonderful carers that help us but with a wider German-speaking audience: Alzheimer, dementia – these affect hundreds of thousands of families in the world regardless of language. Widely sharing our experiences of what works will give everyone a chance to make the best of the affliction – patients and families alike. For the translation, what did you have to take into account; what was the most challenging? The translation was relatively straight forward – there is not much culturally specific content in the stories, the images or the text that requires adjustment or explanation. It is always challenging to find the right tone in emotional dialogue, to be able to give different characters their own voice (rather than your own) – I tried to channel the voices of our German carers and of course my loved ones. Yes: please create more, translate more, share more. When dementia entered our family we were utterly unprepared for it. Members of our family and the community where my family lives met the diagnosis with disbelief, pity, shame, fear, helplessness, or plain old prejudice. It is hard enough to find a way of dealing with this illness; fighting against ignorance – which much of the reactions are based on – should not have to be added to the lot. We need to fix that. If you got more to translate, count me in! Parables of Care. Creative Responses to Dementia Care, As Told by Carers is a research-based comic book originally published in English in October 2017. Parables of Care has now been released in German translation, translated by Dr Andrea Hacker, from the University of Bern, Switzerland. [Read our Q&A with Andrea here]. The comic book was created by Dr Simon Grennan, from the Department of Art and Design, University of Chester, UK; Dr Ernesto Priego, from the Centre for Human Computer Interaction Design, City, University of London, UK; and Dr Peter Wilkins from Douglas College, Vancouver, Canada. The small international team looked to expand the accessibility of this archive of carers’ stories and found that by creating short graphic art stories they could portray the emotional power of these situations. Each story is only four panels and just one page long. Unlike clinical descriptions, this form enhances the affective aspects of each story, putting the reader at the centre of situations that often verge on incomprehensibility, but which are all resolved. In this respect, each story is universalised and becomes a parable. The book is available open access to dementia carers and the general public as part of ongoing engagement, training and development programmes at City, University of London, the Tavistock and Portman NHS Foundation Trust and The Faculty of Health Sciences at Douglas College, Vancouver, Canada. Dr Andrea Hacker is an editor, translator and open science professional who lives in Switzerland where she works at the University of Bern. She has previously lived and worked in the US, Russia, Ireland and Germany. She was mentored in literary translation during her graduate studies at UCLA by Michael Henry Heim. On Saturday 17th November Simon Grennan will present on Parables of Care at The 2nd International Amsterdam Comics Conference, “Drawing Yourself In and Out of It”, 15-17h November, 2018 at Vrije Universiteit Amsterdam, the Netherlands. In a follow-up to our presentation at The First USW Cardiff: Comics Symposium last June, Simon will discuss further the creation of the comic Parables of Care: creative responses to dementia care, in terms of hypotactic correspondences of form, emotional ambiguity and story. 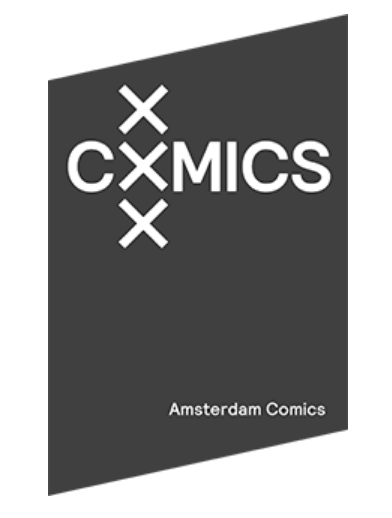 Amsterdam Comics aims to further the interaction between the academic study of comics and its practice. The conference schedule and other relevant information can be found here. Parables of Care is a project of the Centre for Human Computer Interaction Design, City, University of London, The University of Chester, UK, and Douglas College, Vancouver, Canada. Parables of Care can be downloaded as a PDF file, under a Creative Commons Attribution-NonCommercial 4.0 International License, from City Research Online: http://openaccess.city.ac.uk/18245/. Creating Comics, Creative Comics is a 2-day academic symposium taking place on Friday June 1st & Saturday June 2nd 2018 at the University of South Wales, Cardiff. Simon Grennan and Ernesto Priego will make a presentation on Saturday (panel 4) on the work done with Peter Wilkins et al on the Parables of Care project. The title of the presentation is “Hypotactic correspondences between Yonkoma four panel manga, emotional ambiguity and story, in styling and drawing the comic Parables of Care: creative responses to dementia care (2018)”. We will have hard copies of the Parables of Care comic to distribute freely. The First USW Cardiff: Comics Symposium is interested in creator’s perspectives. It will explore comics and creativity and will examine the practice of creating comics, and the particulars of storytelling in comics. Does changing a panel, change the story? How might a medium’s materiality affect its construction and reception? How do the theoretical and philosophical objectives of the maker inform and frame the construction of the works? This symposium addresses these needs from the point of view of the creators involved in the production and creation of comics. Tony Pickering, Diabetes Year One: Drawing my pathography: comics, poetry and the medical self. Dr Enesto Priego, Dr Simon Grennan and Dr Peter Wilkins, Hypotactic correspondences between Yonkoma four panel manga, emotional ambiguity and story, in styling and drawing the comic Parables of Care: creative responses to dementia care (2018). Nick Dodds, Reframing the Graphic Memoir: How can the comic-strip artist negotiate modality and fidelity in the depiction of personal and historical narratives? *In association with Cardiff Indie Comic Expo. Registration for the symposium grants entry to CICE Saturday 2nd June.